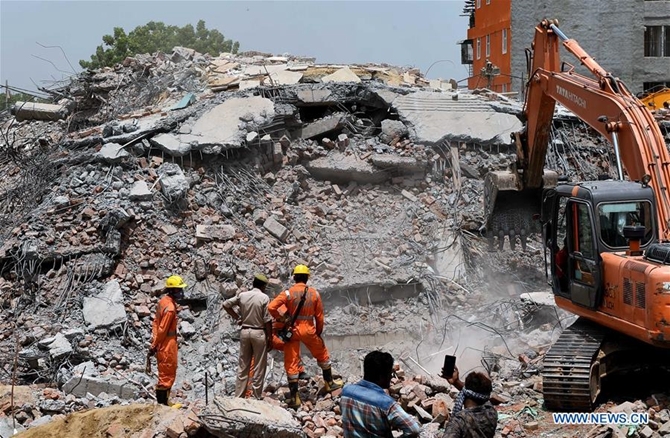 The death toll in the building collapse near the Indian capital has risen to nine, with the recovery of four more bodies late Wednesday night, officials said Thursday. The four-story building collapsed when an adjacent six-story under-construction residential structure fell on top of it in the northern Indian state of Uttar Pradesh's Greater Noida city, barely 45 km from the national capital, late Tuesday night. "Five bodies were initially pulled out of debris by rescuers. Four more bodies, including that of a one-and-a-half-year-old child, were recovered late Wednesday night, taking the toll to nine," a disaster management official said. The death toll may increase later as several others are still feared trapped under the debris, he added. The National Disaster Response Force said it has pressed into service sniffer dogs and used sensors and cameras to look for survivors. "This is an unstable collapse. We are working very cautiously here," local NDRF chief P.K. Srivastava said. Uttar Pradesh Chief Minister Yogi Adityanath has announced compensation for the families of the victims. Meanwhile, police said four people had been arrested for the building collapse. "A probe is underway," a police official said.